Congratulations to Rachel and Chris, who were married at Eaves Hall amidst the stunning countryside of the Ribble Valley, Lancashire. A magnificent country house surrounded by lush gardens, it is the perfect venue for a summer wedding and a very enjoyable experience for an Eaves Hall wedding photographer. On this occasion as with others I co-shot the day with the Fearless Photographer David Stubbs. We began by documenting the bridal preparations in a suite on the property. As a creative documentary photographer, I take natural photos – no stopping or posing – just recording real moments as the day unfolds, as unobtrusively as possible. I am very fond of the black and white shot of Rachel and father of the bride descending the stairs on their way to the aisle, her train billowing behind them. There’s something beautifully vulnerable about Rachel in this photo. Opting to celebrate the whole day on the grounds, the ceremony was held in the ballroom with its abundance of original features – just look at that ceiling! I used mainly black and white photos to record the nuptials and reflect the timelessness of marriage. The only thing lovelier than a bride is a smiling bride and Rachel was never found without a smile on her face. The flower girl had a fabulous time, temporarily oblivious to the vows taking place and fixated on her flower posy. At the reception, the uncharacteristically English lack of rain provided more opportunities for me as an Eaves Hall wedding photographer. This is where my colour photography was really put to use. Family and friends enjoyed drinks, canapés and a game of bowls, in typical country house fashion – look at the groomsmen getting competitive! Even the bridesmaids got stuck in. The newlyweds took a walk across the grounds for a few minutes of reflection. I like the image of Rachel and Chris sharing a moment against a towering garden wall, solid and dependable. We also took some pictures in the meadow next to the hall with wild flowers framing the couple. Again, you will notice that I do not pose anyone but simply encourage them to linger in particular spots. 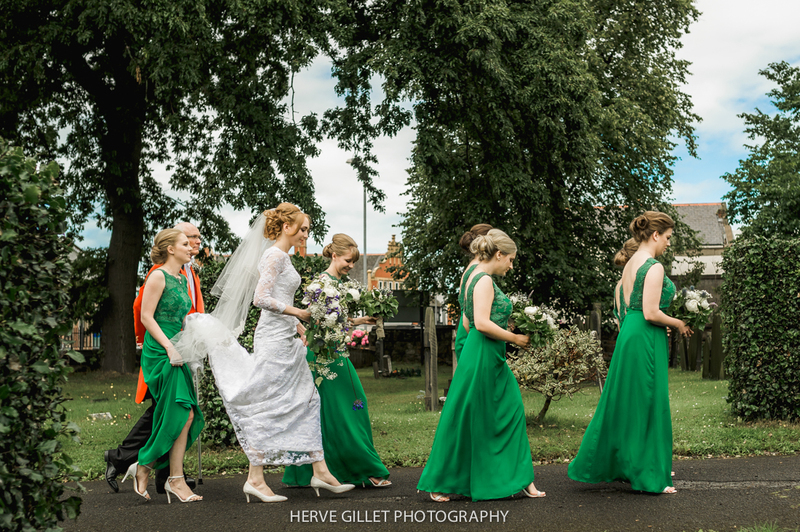 I love these shots which rely on natural light and really capture the colour of summer. There’s something wonderfully down to earth just being at one with nature, a man and his camera. The wedding breakfast was classy but relaxed and there are some lovely shots of the speeches. It was great to see my good friend and renowned wedding DJ DJ Adam Carr providing entertainment at the evening party where guests hit the dance floor enthusiastically! Thank you to Rachel and Chris for inviting me to document your special day and all the best for the future; also to David Stubbs for his collaboration. I hope you enjoy this small selection of images from their wedding gallery and if you are tying the knot and in need of an Eaves Hall wedding photographer please don’t hesitate to get in touch .
" Combermere Abbey Wedding Photographer "
" Thornton Manor Wedding Photographer "
" Best of 2015 "
" Lancashire Wedding Photographer "